Winter in Seattle can be a bit gloomy. With short days and heavy rainfall, we’re usually itching for the first signs of spring. That’s where cherry blossoms at the University of Washington come in. They’re like our local version of Groundhog Day; when the blossoms are blooming — we know warmer weather is officially on the way. The best cherry blossoms at the University of Washington are found in the Quad, which is located in the northeast area of the main campus (click here for a map). Don’t worry — you’ll know exactly where to find the blossoms on a nice spring day. That’s because thousands of people flock to the Quad to see the pinkish-white flowers, take plenty of pictures, and possibly even set up a picnic. 2019 Cherry Blossom Update: As of March 29, University of Washington arborist Sara Shores says the cherry blossoms are at full bloom. Take a live look at the Quad here, see the latest update on @UWCherryBlossom, or stay tuned to Seattle Bloggers for the latest! 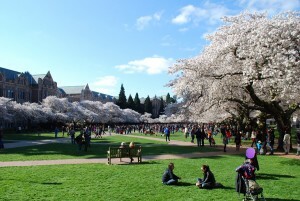 The peak time for cherry blossoms at the University of Washington changes from year-to-year. It all depends on Mother Nature. According to UW, cold weather prolongs the bloom, while heavy rain can knock flowers off the trees. 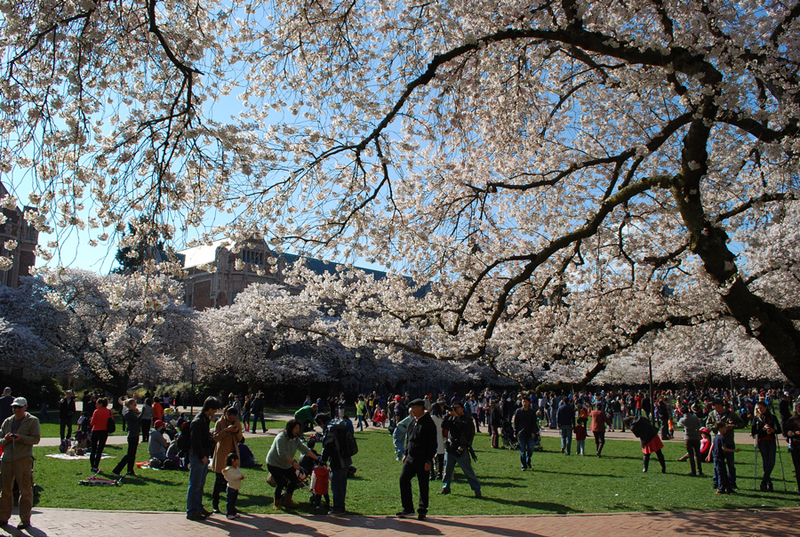 In any event, full bloom at the University of Washington typically happens in late March or early April. NOTE: Just to give you a feel for the timing of the bloom in 2014, the cherry blossoms at the University of Washington were at 15% bloom on March 13th, 50% bloom on March 14th, and at full bloom on March 21st. In 2013, full bloom didn’t happen at UW until April 3rd. The Quad isn’t the only place to enjoy cherry blossoms at the University of Washington. 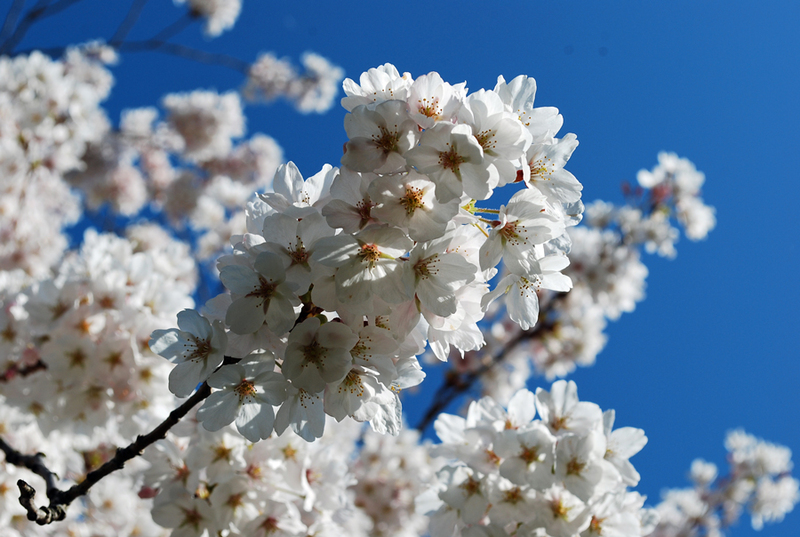 You can also find cherry trees at San Juan Road in South Campus, Rainier Vista, just off Red Square by Gerberding Hall, and new trees are being planted between Johnson and Mary Gates Hall. There are other locations around Seattle to check out cherry blossoms in the spring (Washington Park Arboretum, Jefferson Park, etc. 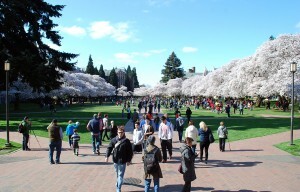 ), but the cherry blossoms at the University of Washington are usually the highlight every year. It’s a spectacular sight to see and one that shouldn’t be missed (said by a dude), especially if you’re longing for a glimpse of spring after a dreary winter. Have you ever checked the cherry blossoms at the University of Washington? What did you think? Where else do you enjoy cherry blossoms around Seattle? We’d love to hear from you! Please leave a comment below, or connect with us on Facebook, Twitter, and Google+. 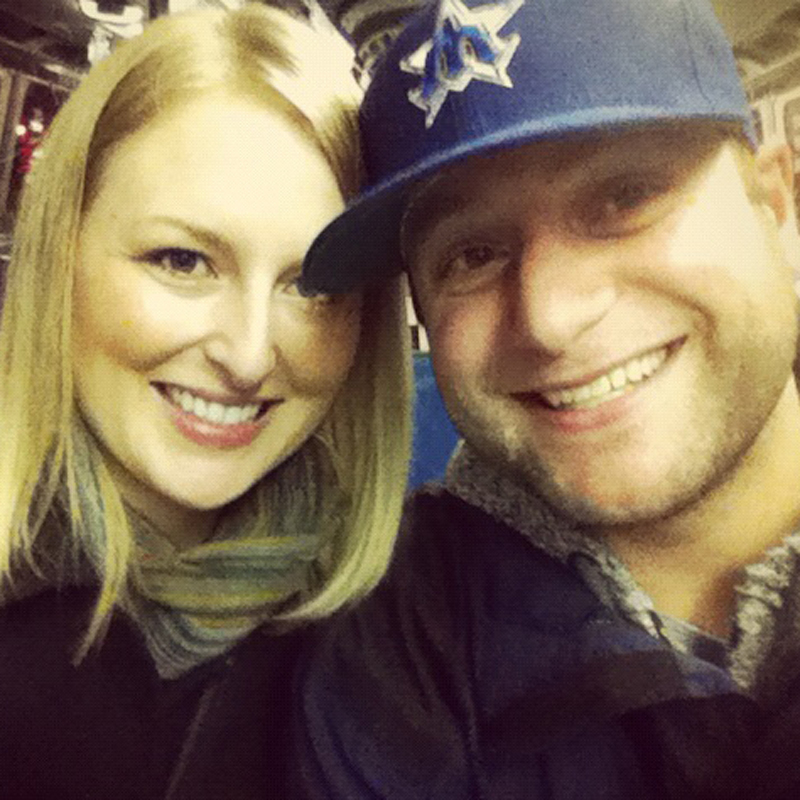 Don’t forget to also visit Seattle Bloggers for more cool places to experience around the Emerald City. I was there last year and it was heavenly, wil try and visit tomorrow.